Google's Chrome browser (http://www.google.com/chrome) got a lot of attention when it was initially released, and deservingly so. I personally like most of the features implemented in Chrome, but unfortunately the lack of a Linux port makes it harder to test it out. 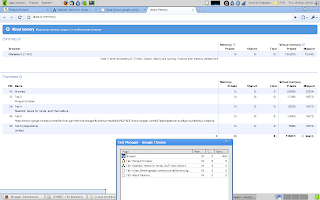 I tried running Chrome with Wine, but there were few configurations that needed to be done that I didn't have time for. Therefore, my Chrome experiments had to be shelved for a later time. Now thanks to Codeweavers, the company behind the CrossOver Office product, the open source version of Chrome is available as CrossOver Chromium (http://www.codeweavers.com/services/ports/chromium/) for both Linux and Mac users to try out using Wine. This is a wonderful effort by Codeweavers that goes to show how mature Wine has become and how easily adaptable it is. Installing CrossOver Chromium is a breeze. Just grab the setup from the Codeweavers website and run it. The installer will automatically take care of the rest. CrossOver Chromium is quite stable and responsive in my Fedora 9 box. Ofcourse, HTTPS connections will not work because the libraries are not yet fully implemented on Wine. Although Flash is installed using winetricks, Crossover Chromium doesn't seem to recognize it. So Flash animations are out of order at the moment as well. 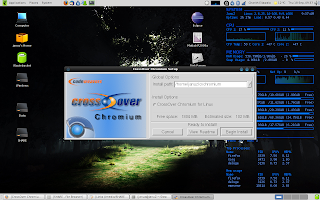 As clearly mentioned in the Codeweavers site, CrossOver Chromium is not intended as a full software distribution. It is just a proof-of-concept that any sufficiently complex Windows program can be ported to Wine with minimal effort. I think Codeweavers have managed to prove this point splendidly and in the process have enabled us Linux users to experience Chrome without having to boot Windows. Kudos to the team at Codeweavers for the effort. Don´t have time to comment, Hav to run . 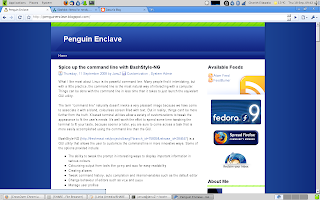 To try out the Chrome in my Fedora box. C ya. But Why don't shortcuts work ?? But why don't shortcuts work ? But Why don't shortcuts work ?? ?